Walsh Gallery was founded in 1993, and specializes in contemporary Asian art. In 1997 the gallery began exhibiting the first of a series of surveys on contemporary Japanese prints. In 1998 Walsh Gallery brought M.F. Hussein to Chicago for a solo exhibition. Since then the gallery has exhibited such renowned artists from the India as Bhupen Khakhar and Gulammohammed Sheikh (2002), Atul Dodiya (2002), and Ravinder Reddy (2003). Walsh Gallery has always had a focus on contemporary Chinese art and in 2000 showed Shanghai 2000, an exhibit of 11 artists from Shanghai that included among others: Ding Yi, Xue Song, and Shen Fan. In 2003 Walsh Gallery showed "Relative Reality", a new media show which traveled from Seoul, to Hawaii, and Chicago. The gallery has been showing an increasing amount of new media work, installations, large-scale sculpture, and photography. In April of 2004 Wu Hung, former curator of the Guangzhou Triennial and Shanghai Biennial 2000, curated "Visual Performance" in the Walsh Gallery space. 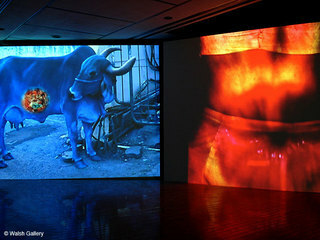 This new media show included the work of Nalini Malani, Song Dong, Wang Gongxin, Ranbir Kaleka, Zhou Xiaohu, and Jongbum Choi. Wu Hung has been a frequent guest curator at Walsh Gallery. Among the shows he has curated were the Guangzhou Triennial, "About Beauty" at the House of World Cultures, "Between Past and Future: New Photography and Video from China," Miao Xiaochun (2004-2005), Rong Rong and inri (2005), Zhang Dali (2006), and Mo Yi (2007). In 2007 Walsh Gallery hosted "Service Station" a show of 14 emerging South Korean artists. The show was organized by Wongi Sul and curated by three young Korean curators: Sunhee Choi, Seewon Hyun and Jisun Song. This exhibit challenged more traditional views of what Korean art is today. Also, in 2007 Walsh Gallery launched a New Media Lounge where visitors can view video pieces and installations by the best talents from Asia. Walsh Gallery has had a special interest in the field of new media and has been a pioneer participant in DiVA (Digital and Video Art Fair) since 2005 in Cologne, Paris, New York and recently, Miami. The gallery will also participate in V07: Venice Videoart Fair, in Venice on June 8-9 of this year. Finally, the Gallery has been reviewed and written about in such publications as Artforum.com, ARTnews, Time Out (New York and Chicago editions), the Wall Street Journal, the Chicago Tribune and the Chicago Sun-Times. Walsh Gallery artists have appeared in Biennials and Triennials around the world, and are frequent participants in museum shows worldwide.